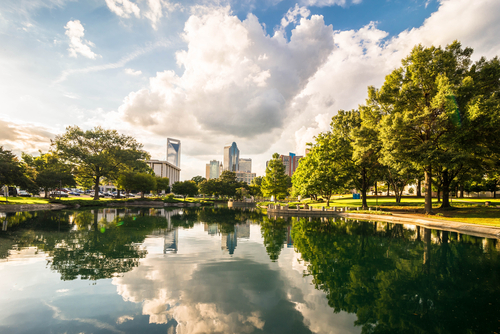 Charlotte’s rental market is expected to remain healthy this year as a number of development projects and corporate relocations support the economy, says our Research Services team. The metro already has one of the finest and busiest international airports and the expansion of its light rail transit system will further add to economic growth, generating thousands of construction positions. The extended LYNX Blue Line will connect the 7th Street Station in Uptown Charlotte, North Davidson and University areas, and the University of North Carolina’s Charlotte campus by next year. Access to mass transit will generate renter demand in these areas. Uptown Charlotte is also bustling with activity as two massive construction projects are underway: the Tryon Place and 300 South Tryon. Meanwhile, with the economic recovery, a number of companies are also relocating to the metro. Near the Douglas International Airport, packaging company Sealed Air Corp. will move thousands of employees to its new campus this year. Household formation will accelerate the pace of rent growth, while vacancy rates are expected to inch up modestly as new apartments come to market in core areas. 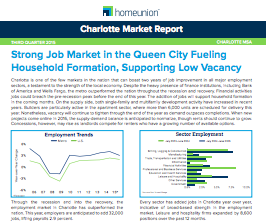 Download the report to find out projections for employment trends, home prices, and more for the Charlotte market. 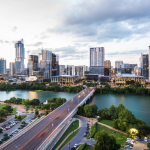 This market report evaluates multiple sectors of the economy that affect risk-and-reward for single-family real estate investors.